I have walked past this place about a million times (rough estimate) and often thought I should stop in. My time in NYC is always too brief and I have developed my favorites in the neighborhood (such as Turkuaz and of course Barney Greengrass) that I find myself wanting to revisit those rather then try something new. But my next trip is a few weeks away so I may finally have to make time! It is definitely worth a try - quality, quantity, variety - all good reasons to pop in for a visit. Would you place the Cuban items as being better, worse or on par with Cafe Con Leche (if you have ever been)? 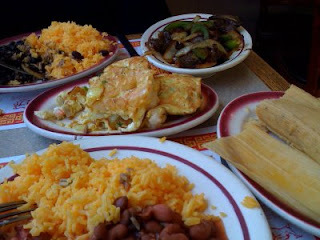 I asked a friend who recommends Cafe Con Leche for breakfast/brunch and really likes La Caridad 78 for lunch. BTW if you have not had it yourself the rum cake at Con Leche is to die for!